1/2 Peruvian, 1/4 Bolivian, 1/4 Chilean - Larita is a proven producer of Gray and Black show quality Suris. Larita's dam has produced ALL FEMALES, and so far, Larita has done the same! She has produced three vigorous females, blessed with their mother’s luster, fineness, solid frame and confidence. 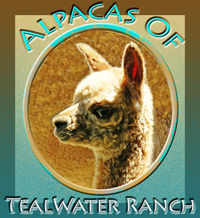 We have two of Larita’s beautiful females in our herd — Tealwater Rosalie, who has won two Blue Ribbons, a Second at AOBA Nationals, and a Reserve Color Champion from the previously-shorn full fleece class. 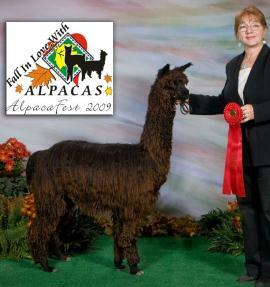 Rita’s 2008 female cria Hope, a beautiful bay black, began showing in September 2009 at the All Suri Sweepstakes in Ohio. 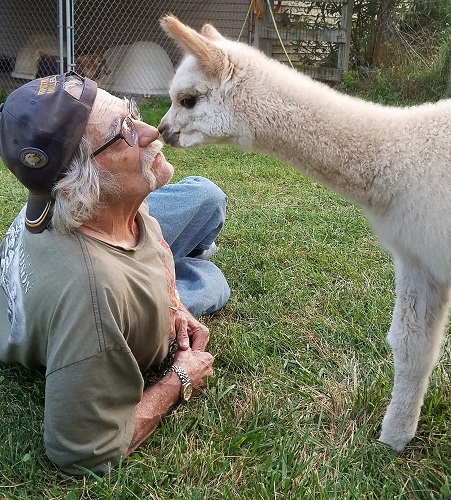 Hope continues to regrow high-luster, dense silky fleece every year. 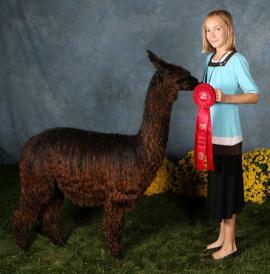 Hope was slick shorn mid-May 2011, yet showed in Adult full fleece class and won the Blue with competition at MIAF in Oct. 2011!! Hope is confident, friendly, very well structured and really packs on the fleece! She has a lovely, fine silky hand with great luster, and has done well in shows. At OABA under judge Amanda VandenBosch she placed 2nd in a class of five true and bay black yearlings (no color champion class). 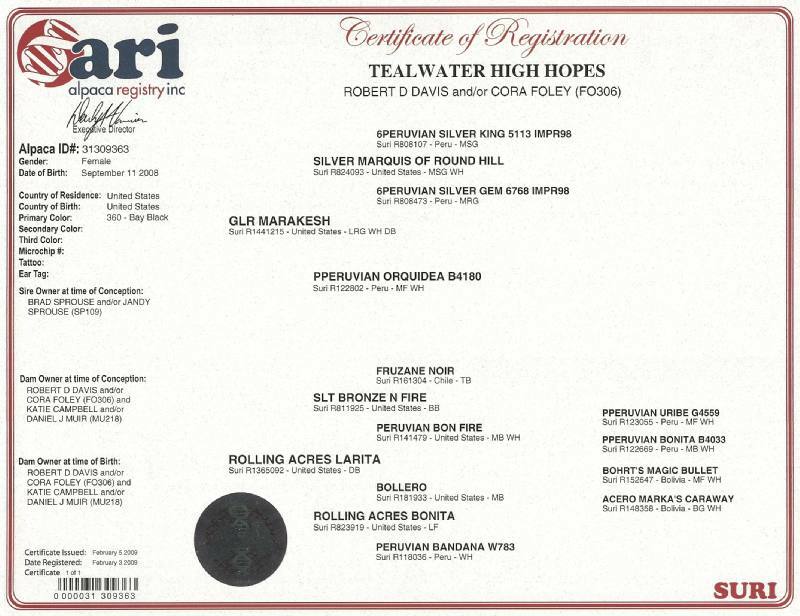 In the first ever all Suri Sweepstakes in Findlay, Ohio, she placed 3rd in a class of four with the combined scores of three Suri Judges: Mary Reed, USA, Lavona Fercho, Canada, and Dr. Rufino Quilla, Peru. She carries the powerful genes of 6Peruvian Silver King, Fruzane Noir, and PPeruvian Uribe, and the rich bay black lustrous locks of her dam. 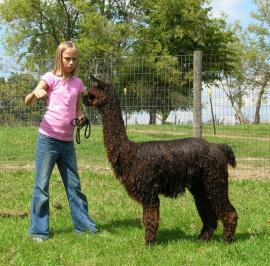 This girl will add rare color, an abundance of silky fine locks, and strong genetics to any breeding program. 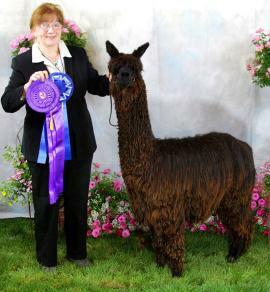 DARK SURI COLOR CHAMPION was awarded to Hope at the Michigan Breeders Show on May 1, 2010! The judge's comments noted her good bone, flowing gate, beautiful Suri phenotype, and the soft handle, fineness, density and luster of her fiber all contributed to this Champion award. Don't delay - there aren't many Champion black female suri's for sale in the Great Lakes Region!